With a new administrator at the helm, the U.S. Food and Drug Administration took steps toward regulating decision support, software-as-a-medical-device, mobile tech in clinical trials and more. Beyond fielding an ever-increasing number of digital health clearances, the FDA had a full plate in 2017 as it sought to revise its regulatory processes for the shifting healthcare landscape. The beginning of the year saw a new administration take the reins, and with it the nomination and appointment of a new commissioner, Scott Gottlieb. By year's end, the new guard already had announced and implemented a firm-focused pre-certification program, released new guidances addressing provisions of 2016's 21st Century Cures Act, and outlined a handful of other ongoing initiatives that are sure to impact the digital health industry. Here's a rundown of the agency's actions and announcements during 2017. Unlike his predecessors, Gottlieb had been very vocal about his thoughts on mobile health regulation prior to his appointment. Roughly one month after his confirmation, the commissioner penned a blog post outlining a plan that included clear language on which devices the agency would look to regulate, an app regulation strategy involving postmarket data collection, and other idea designed to streamline the approval process. "To encourage innovation, FDA should carry out its mission to protect and promote the public health through policies that are clear enough for developers to apply them on their own, without having to seek out, on a case-by-case basis, FDA's position on every individual technological change or iterative software development," he wrote. The coming months proved Gottlieb true to his word. The FDA opened up applications for a pilot of a firm-focused digital health pre-certification program in July and, just two months later, announced the nine companies selected to participate: Apple, Samsung, Verily, Pear Therapeutics, Tidepool, Phosphorus, Fitbit, Roche, and Johnson & Johnson. Should the FDA deem these firms to be responsible and safe in their development processes, each would no longer need to seek the regulatory body's blessing for each individual product. Gottlieb also announced in November that direct-to-consumer genetic health risk tests would soon be seeing a similarly streamlined process. 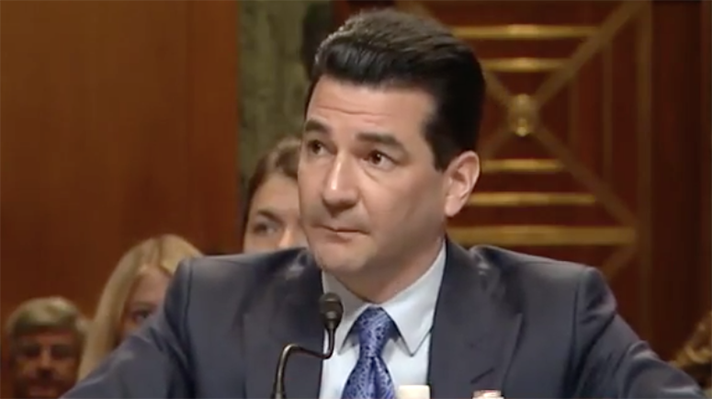 Gottlieb's other regulatory promises came closer to fruition near the end of the year when the agency dropped a handful of new FDA guidance documents. One was a draft of the long-awaited and somewhat controversial guidance on clinical decision support, which laid out the forms of clinical decision support that would or wouldn't be regulated based on the degree of human involvement (as opposed to risk). Another draft dealing with changes to medical software policy based on Congressional mandates in the 21st Century Cures act outlined more device categories that would stay outside of FDA regulation: hospital administration software, wellness software, EHR software, and certain data-use software. Also of note was an October draft guidance describing the FDA's new Breakthrough Devices Program. Another product of the 21st Century Cures Act, the program would supersede the Expedited Access Pathway and aims to push novel technologies presenting a significant improvement over status quo through the clearance process more quickly. Alongside these drafts came a few final guidances as well. Two of these are designed to help developers understand when a modification to a device (or a software update) would require a new 510(k) clearance, while the third provides the agency with "an initial framework" for developing regulatory oversight for software as a medical device, or SaaMD. Other announcements outside of new guidances also illustrated the FDA's growing interest in updating the approval process for digital technologies. In June, the Clinical Trials Transformation Initiative – a public-private partnership of pharma companies, academics, and regulators including the FDA – released new endpoint recommendations for the use of mobile technologies in clinical trials. The guidelines, meant to be the first in a series of such documents, included suggestions for study designers when selecting novel endpoints, practical approaches when developing these endpoints, and other relevant recommendations. A few extra clues on the agency's inner workings also came in March, when the health subcommittee of the House Energy and Commerce Committee met to question Jeffrey Shuren, director of the FDA's Center for Devices and Radiological Health. The primary topic was the medical device user fee amendments, of MDUFA – and agreement between the FDA and industry in which the FDA makes certain agreements in return for the industry's financial backing through device regulation fees – and during this discussion, Shuren outlined how the agency has been reorganizing to centralize its digital health operations. Shuren's discussion on MDUFA would go on to address the FDA's goals of better generating real-world evidence for health technology and improving patient engagement. The latter has been an ongoing focus for the FDA since a provision of the Food and Drug Administration Safety and Innovation Act, or FDASIA, was signed by President Obama in 2012. Following comments from the public, FDA floated the idea of creating an Office of Patient Affairs in March, and on October 11th and 12th held the inaugural meeting of its Patient Education Advisory Committee to better incorporate patient feedback during regulatory discussions.